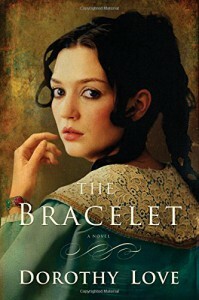 The Bracelet is the first book by Dorothy Love that I’ve ever read. The title, the beautiful cover and the description of the book made me want to read it. It also has a good and classic cast of characters. A line up you would expect in historical fiction stories like this one. The story is set in Savannah and loosely based on true events, a fact that for me made it appealing to read. It takes place in 1858, so the conflicts between North and South regarding slavery, secession and war are still palpable. It is not a book about slavery per se, the family portrayed isn’t a slave owning family, but being that it takes place during the Pre-Civil War time period, the situation is addressed. I was intrigued about the secrets behind the deaths. I kept trying to guess what would happen next and who did what. I questioned Celia’s actions and I kept suspecting on Ivy. I had a love and hate relationship with Ivy. 1. Even though it was an enjoyable and interesting read, overall I felt like it didn’t fully meet my expectations of a “romance, rich historical detail, and breathtaking suspense”. 2. Despite the classic cast of characters, there was an important non -human character that I felt got a bit robbed: The Bracelet.